There is a wide range of conditions that first appear as purplish discolorations on the skin. Some conditions may be harmless and treated with cosmetic cover-ups, other discolorations can signal serious skin diseases that must be tested and treated. A diagnosis from a dermatologist can relieve any concern about purplish marks. On average, nearly one out of 1,000 babies is born with vascular birthmarks that are port wine in color. They can be flat or raised and are made up of an excess of blood vessels clumped together in one spot. According to the American Academy of Dermatologists, there is no known cause of birthmarks; they are neither inherited nor are they a result of anything a mother may do during pregnancy. The birthmarks, also called nevus flammeus, come in a variety of sizes and are commonly found on the neck and face. They tend to grow in proportion to the child’s growth and are permanent. Port wine birthmarks often become bumpy or thick and develop ridges. A port wine birthmark should be monitored by the pediatrician to make sure it does not interfere with other growth processes. Lesions that are purple and irregularly shaped often are associated with lupus, an autoimmune condition that causes a vast spectrum of symptoms, including skin lesions. According to the American Academy of Dermatologists, up to 65 percent of patients with systemic lupus will develop skin discoloration in the face and neck. The darkness and lightness of the lesions may vary and may become thick and scaly. Sun exposure worsens the lesions, which left untreated can lead to skin cancer in some patients. The most common form of purplish skin in lupus patients looks likes a patchy sunburn and often first starts as a butterfly rash on the face. When the neck is exposed to continued sunlight, skin cancer can develop. Reddish, purple or brown mole-like spots may be the first indication of a melanoma or carcinoma. According to the Mayo Clinic, melanoma on the neck is most prevalent in men, while women tend to develop the disease on their lower legs. Any unusual bumps or moles that are discolored should be tested by a doctor, especially if the spot changes shape or form. When blood glucose levels become high, the skin tends to dry out and become cracked and reddish or slightly purple in color. Skin problems are common among diabetics and should be treated because dry skin can crack and become infected. Darkened skin on the neck is common among obese patients suffering from diabetes, according to the Cleveland Clinic. 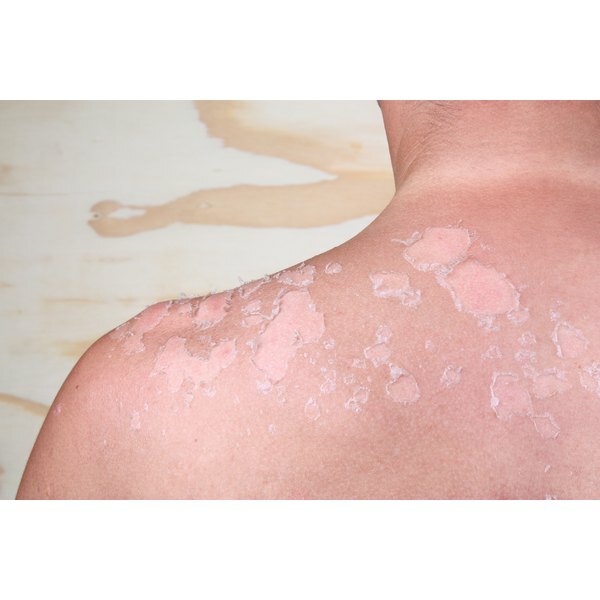 The skin condition, also called acanthosis nigricans, also sometimes appears on the neck prior to an actual diabetes diagnosis. What Kind of Doctor Removes Moles?